Just recently found your blog & I am loving it! My hubby & I have had pretty good luck flipping jerseys bought at thrift stores. Our favorite sale was actually a Chunichi Dragons Japanese Baseball league authentic jersey that we found at Salvation Army on half-off day that we then sold on Ebay for $165! Not bad for a $3.50 purchase. Gail-A Japanese baseball jersey?! That's what I call a unique find!! $165 is definitely a homerun-Ha! I've had some very good luck with Japanese buyers. About a year ago I blogged about selling a camping light to a Japanese buyer for over $200. There are some serious collectors over there! I am glad you found my blog and are enjoying it. Thanks & keep coming back for more....Dude! While that’s generally the case, the value also depends upon the player, team, & perhaps the “situation”. For example, a Tim Tebow jersey was one of the hottest sellers earlier in the year but after being demoted to 3rd-string amidst trade rumors, you can now get a Tebow Nike game jersey for just 30 bucks and a Mark Sanchez jersey for 60 (these normally retail for $100). These are two players that are still on the team, yet the values have plummeted. Peyton Manning’s old Colts jersey on the other hand still commands top dollar even though he’s now a Bronco. You’re right about the Mitchell & Ness jerseys of retired stars – they’re still gold on eBay and Amazon. 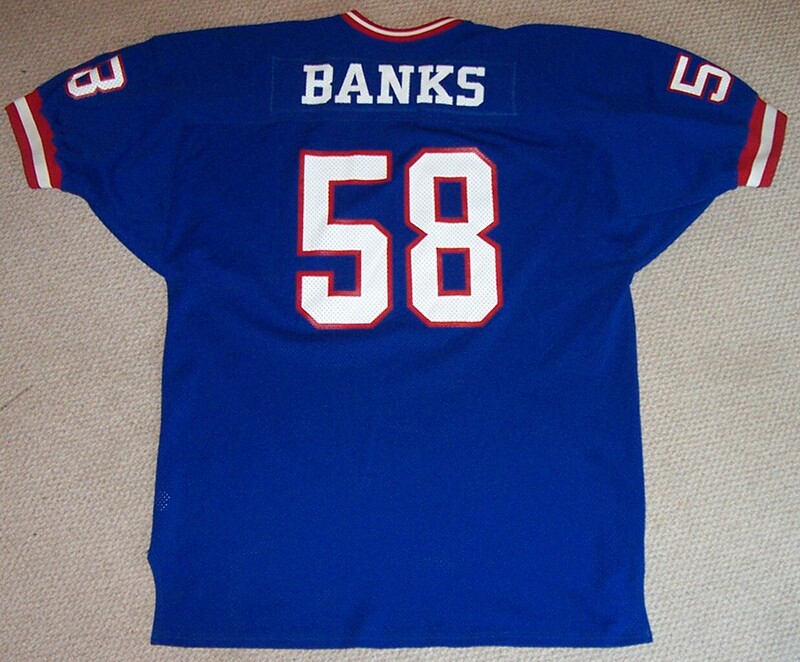 There’s currently an M & N Carl Banks jersey on Amazon.com selling for $135 and a Jerry Rice for $230. More on NFL jerseys here. But I digress… this is a blog about garage sales, not the NFL. I have got to get myself to a Goodwill store. Jim-Yeah, I am always amazed at what pops up in the racks at the Goodwill Store. Sounds like you're in the jersey business and know how tricky it can be. I can't tell you how many times my heart has skipped a beat on finding a beautiful, top-quality stitched jersey, only to realize the player has moved on. Good example of this would be a Packers Brett Favre, Nuggets Carmelo Anthony or Cleveland's Lebron James. All jerseys that use to net big money on eBay, but now are almost valueless. Although I am sure over time those same jerseys will eventually go back up in value as "throwbacks" after fans get over the hard feelings of their players leaving town. Interesting how prices jump up and down with the Tebow and Sanchez jerseys, it's like commodities, right? And I am going to keep an open mind the next time I find a Colt's Manning jersey. Thanks for writing in and sharing your knowledge on the subject......Dude! I buy and sell toys. Not just vintage but even stuff that came out as recent as last years. In fact, I'm skimming your blog now for the first time to see if you've posted anything about toys. Anyway, I do love baseball and football, but when I hit garage sales or flea markets, I often turn my nose up at all the clothes. This is a really good reminder that a quick look through them could certainly be in my best interest. I've even sold an old jersey that my wife had from the first Olympic Dream Team. It's not something I should have so quickly forgotten. Thanks for the reminder. Kathy-Checked out your blog and it made me hungry! Mmmm-good! So I am following now. I appreciate you writing in and following mine,thanks...Dude!